The horse chestnut tree is a popular ornamental addition to parks and backyards, but it is also a powerful medicinal herb with several useful health benefits. Learn what horse chestnut has to offer! Horse chestnut is native to Eastern Europe – specifically, the Balkans – and to the Himalayas of central Asia. Nowadays, horse chestnut typically grows naturally across temperate European regions in gardens, parks, and along roadsides. Horse chestnut trees are often grown ornamentally, thanks to their lovely flowers and ample shade, but they have also been shown to have useful medicinal benefits. Strengthening veins. Horse chestnut has the ability to strengthen blood vessels to ameliorate conditions like varicose veins and chronic venous insufficiency. Reducing edema. Fluid retention can be improved with the use of horse chestnut. Treating injuries. Horse chestnut can bring down swelling from injuries such as sprains and can also help heal small skin wounds. Horse chestnut contains a mixture of saponins that are collectively called escin, and have been shown to strengthen the walls of small blood vessels. Research suggests that escin may be as effective at treating venous problems as compression stockings. It also can help relieve fluid retention in the body as well as reduce exudate, the fluid that leaks from blood vessels or organs when they have been injured, causing inflammation. The tannins present in horse chestnut may also contribute to these anti-inflammatory and anti-edema properties. Tannins are also astringent, providing a cleansing effect for wounds and skin ailments. Diuretic properties are also present in asparagus and celery, whereas cleavers and greater plantain promote wound healing. Horse chestnut supplements are mostly safe for consumption, but they may cause some minor side effects. These include itching, nausea, gastrointestinal upset, muscle spasm, and headache. The raw or unprocessed seeds, leaves, bark, and flowers of the horse chestnut should never be eaten; they contain esculin, which is poisonous and can increase the risk of bleeding. Cooked horse chestnuts and medicinal preparations are esculin-free; however, caution should still be exercised before consuming horse chestnut in any form for those suffering from a blood disorder, diabetes, a stomach condition, kidney disease, or liver disease, as well as those who are pregnant or breastfeeding. Additionally, horse chestnut may interact dangerously with blood thinners or drugs that lower blood sugar, such as medication for diabetes. Horse chestnuts can be eaten alone, but they can also be consumed in a number of different medicinal preparations. These remedies may be taken internally or externally, depending on their intended purpose. Horse chestnuts can be toxic if eaten in large quantities, so care should be taken when consuming them in this way. Roasted. Horse chestnut flower buds were once used for flavoring beer, and nowadays, the chestnuts can be roasted and eaten as a snack or added to culinary dishes and salads. Infusion. For an infusion, steep one teaspoon of horse chestnut bark in one cup of water. This tea can help treat varicose veins and other similar conditions. Decoction. Horse chestnut tea can be brewed by steeping dried leaves or bark from the tree in boiling water for several minutes. The tea will help to strengthen blood vessels and reduce fluid retention. Powder. One-half teaspoon of powdered horse chestnut should be taken once per day for best results in strengthening veins and reducing edema. Tincture. Several drops of a tincture mixed in a drink will work similarly to an infusion. Drops may also be added to lotions to use on injuries like sprains. Ointment. Horse chestnut ointment should only be used externally. It can be applied to small skin wounds, like cuts and burns, to promote healing, or to sprains and other injuries that cause swelling and fluid retention. Capsules. 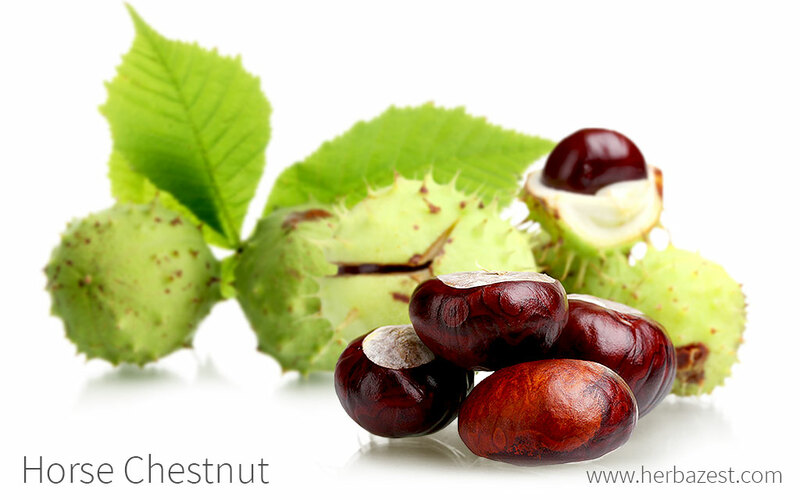 Horse chestnut may also be taken in capsule form for a quick and convenient daily dose. Roasted chestnuts can be found as a typical street food during the fall across most towns in Southern Europe. They may also be roasted at home and used in medicinal forms, such as infusions and decoctions. Many horse chestnut supplements can be widely found at grocery stores, specialized herbal shops, and local markets. Ointments may also be available at specialty skincare stores. Horse chestnut trees are useful for creating herbal remedies, but they are notoriously difficult to grow for the backyard gardening aficionado - they have a germination rate of just 50%, so first-timers are advised to gather twice the amount of seeds than necessary. The ideal soil for a horse chestnut tree is moist but well-drained, sandy loam, with plenty of organic matter. It may adapt to poor or dry conditions, but will most likely develop leaf scorch in warm weather if planted in those type of soils. Soils with a variable range of pH levels can support the growth of the horse chestnut tree. Horse chestnut needs full sun and frequent moisture. It cannot tolerate excessively dry conditions, so should be watered if rainfall is not adequate for its needs. To grow a horse chestnut tree, the seeds should be peeled and sown into sterilized pots in a 50/50 mixture of soil and compost, at a depth of 1/2 inch (1 cm) from the surface. Seedlings must be transferred into final ground as soon as they grow to three inches (8 cm). If more than one tree is desired, they should be planted at least 27 feet (8 m) apart. Depending on climate conditions, horse chestnut seedlings should be planted in the spring or fall. Horse chestnut grows best in zones 4 - 7. Care should be taken to ensure that seedlings have ample space above and around them to grow, at least 60 feet (18 m) in each direction. Horse chestnut is prone to fungal infestations, in particular those causing leaf blotch and wood rot. Horse chestnut is a deciduous tree that can live for up to 300 years. The tree usually reaches heights of 50 - 80 feet (15 - 24 m), but can occasionally grow up to 100 feet (30 m) tall. It has large, medium green leaves, and each leaf has five to seven pointed leaflets. The flowers are white and pink and usually appear in mid-spring, after the leaves have fully expanded. Horse chestnut's fruit is a spiky brown husk that contains one to six seeds. The seeds, also called conkers, are shiny brown nuts. Horse chestnut has a few other common names, including buckeye and Spanish chestnut. Horse chestnut (Aesculus hippocastanum), is a deciduous tree in the Sapindaceae family, which contains 150 genera and is also known as the soapberry family for the lathery, soap-like qualities that many of its species possess. There are no varieties or subspecies of horse chestnut identified thus far, although there are two closely related species that grow in North America: California buckeye (Aesculus californica) and Ohio buckeye (Aesculus glabra). Horse chestnut was introduced to England in the early 1600s and was traditionally a tree of kings and wealthy landowners. Later, it became Britain's municipal tree of choice and was planted decoratively along avenues and in parks all over the country. Traditionally, horse chestnut was used for soap and shampoo because the seeds produce a soapy lather. Horse chestnut conkers, or seeds, were used to manufacture explosives during the First World War when rationing made other sources of acetones unavailable. While horse chestnut is valued as an ornamental tree, and also for its use as both an herbal remedy and an additive in some soaps and cosmetics, it is not as popular an herb as it once was. Because of its minuscule role in industry, no reliable data is available on horse chestnut sale and production. In European folk medicine, carrying twigs of horse chestnut in one's pocket was believed to be useful for preventing and curing arthritis. Personal care. Horse chestnuts produce a soapy lather, making them a useful additive to certain shampoos and soaps. Repellent. Horse chestnut conkers have also been used to repel moths in order to prevent damage to clothes stored in closets for a season. Along with being a beautiful ornamental choice for parks and yards, horse chestnut is a useful medicinal herb. Though it may be harder to find than other, more popular herbs, its health benefits - especially its ability to strengthen veins and reduce swelling - make it worth the effort.